Time to channel your inner Irishman! 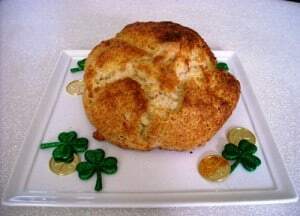 Well, actually, the chemical reaction that makes Irish soda bread wasn’t actually invented by the Irish. American Indians are credited with the actual invention, but due to a state of poverty in Ireland, Soda Bread became popular in the area because it was the easiest bread to make. 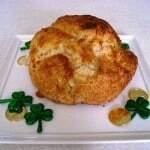 Serve Irish Soda Bread with jam and tea, or pair it with some Irish Potato Soup, so at least you’ll have one truly Irish dish! If you’re looking for a delicious and easy bread to make that doesn’t require any yeast, it looks like you’ve found it. Irish soda bread requires just a few simple ingredients and the baking process is straightforward. In a large bowl mix the dry ingredients including the flour, sugar, baking soda, baking powder and salt. Add the softened butter and continue to mix. Using a pastry cutter makes the process of cutting in the butter and other wet ingredients much easier. Once the butter is distributed throughout the flour, add the buttermilk and egg, continuing to work with the pastry cutter. Once, the ingredients are well mixed, start working the dough with your hands and knead it into a round-shaped loaf. Place the loaf on a non-stick baking surface. At this point, you can combine the 3 tablespoons of butter and buttermilk to form a topping for the bread. Using a pastry brush, brush the mixture all over the loaf. Now it’s time to put the loaf in the oven on the middle rack. Bake for about 50 minutes. You can tell when it’s done when it’s nicely browned and a toothpick inserted in the center comes out clean. Allow to cool slightly, but do try to enjoy it warm. It’s delicious! The bread tastes best warm with a little butter melted on top. It goes great with Irish potato soup too.